From the Cumberland Gap to the Atlantic Ocean, this is Virginia Water Radio for the week of June 3, 2013. This week, in honor of the recent observance of Memorial Day, we feature another song in the theme of the role of rivers in the American Revolutionary and Civil Wars. Have a listen for about 40 seconds. You’ve been listening to part of “Richmond is a Hard Road to Travel,” performed by Bobby Horton on the 1988 album “Homespun Songs of the C.S.A., Vol. 4.” First published in 1863, the lyrics recall the series of unsuccessful attempts by Union forces to take the Confederate capital of Richmond in 1861 and 1862. 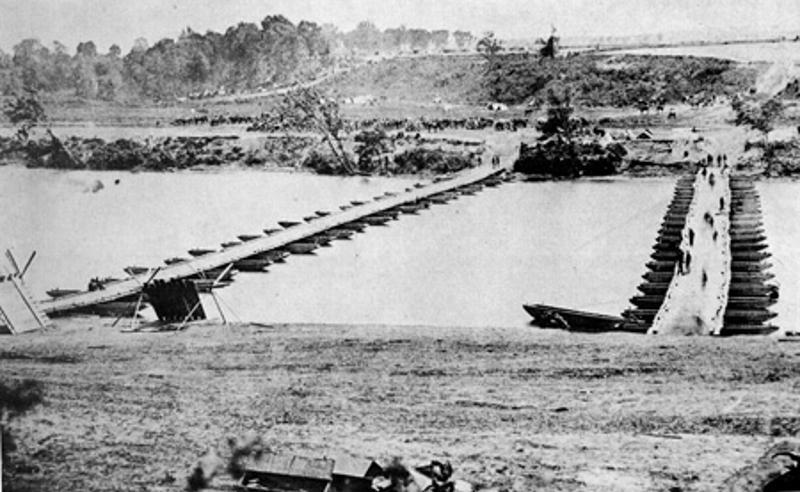 Those attempts included opportunities and challenges presented by various Virginia waters, including Bull Run, the Chickahominy River, the James River and the peninsula between it and the York River, and finally the Rappahannock River at Fredericksburg in December 1862, the subject of our song excerpt. Over 150 years later, the simple phrase “A hard road to travel” helps remind us of the great sacrifices—on many lands and waters—that we honor on Memorial Day and all year. Thanks to Bobby Horton for permission to use this week’s music. Acknowledgments: “Homespun Songs of the C.S.A., Vol. 4” and its version of “Richmond is a Hard Road to Travel” are copyright by Bobby Horton, used with permission. More information about Mr. Horton is available online at http://bobbyhorton.com/. Two previous Virginia Water Radio episodes (also featuring music by Bobby Horton) on rivers in the Revolutionary and Civil Wars are Episode 103 (Week of 3-19-12) (York River in the Revolutionary War battle at Yorktown, Va.) and Episode 101 (Week of 3-5-12) (Potomac River and others in the Civil War). Sources and more information: Information on “Richmond is a Hard Road to Travel” was taken the Library of Congress, online at http://www.loc.gov/item/ihas.200002583; “Poetry and Music of the War Between the States/Confederate Poetry,” online at http://www.civilwarpoetry.org/confederate/songs/richmond.html; and “Traditional Ballad Index,” California State University at Fresno, online at http://www.fresnostate.edu/folklore/BalladIndexTOC.html. The melody is based on “Jordan Am a Hard Road to Travel,” attributed to Daniel D. Emmett in the 1850s. The lyrics were first published as part of “Southern Songs of the War” by A. E. Blackmar in 1863. Information on the Battle of Fredericksburg and other Union attempts to take Richmond in 1861-62 was taken from the National Park Service’s Web site on Fredericksburg and Spotsylvania National Military Park, at http://www.nps.gov/frsp/fredhist.htm; and the Civil War Trust’s Web site on Fredericksburg (at http://www.civilwar.org/battlefields/fredericksburg.html?tab=facts), on the Peninsula Campaign (at http://www.civilwar.org/battlefields/yorktown/yorktown-history-articles/peninsulaquarstein.html), and on the Seven Days Campaign (at http://www.civilwar.org/maps/seven-days-campaign/sevendaysmap.html). Information on rivers and streams involved in Civil War battles is available from the "USA Civil War" Web site at http://usa-civil-war.com/CW_Rivers/rivers.html. 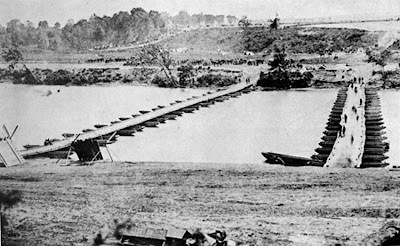 A photo gallery of rivers involved in Civil War battles, including several in Virginia, was published in October 2011 by the Washington Post and is available online at http://www.washingtonpost.com/lifestyle/style/the-rivers-that-shaped-the-civil-war/2011/10/05/gIQAICseUL_gallery.html#photo=15.